21 startups battled to win the favor of judges in complete darkness at an event hosted by Citigroup in Jaffa Monday. Each company had five minutes to present its products, and finalists went on to present their companies from behind a curtain. The winner: Avenews-GT, an agricultural produce trading platform that uses blockchain technology. The contest, called “Pitch in the Dark,” was held in collaboration with Visa, Israel Discount Bank Ltd., and Nasdaq-listed software company Intuit Inc., with Calcalist as a media partner. The unusual setup was meant to increase objectivity, in hope of creating a more diverse tech hub in the country, said Ornit Shinar, head of venture investments in Israel for Citi. While the setup made for a new experience, her eventual choice of company would have probably been the same if it was held with the lights on, said Irit Kahan, a managing director at Deutsche Telekom Capital Partners and one of the judges at the competition. Kahan did say that the body-language of entrepreneurs pitching their companies impacts the assessment of companies. Founded in 2017 and based in Tel Aviv, Avenews-GT aims to connect industrial buyers directly with the farmers, also providing management, logistics and financial tools to smaller sellers, explained co-founder Ismail Kharoub, who also serves as the company's chief technology officer. Israel-based Ladingo Ltd., founded earlier this year, came in at second place. The company develops a system for optimizing cargo containers that enables maritime shipping companies to combine several international deliveries from one country to another. Its service lets private consumers order from many different retailers, and Ladingo coordinates the various orders into one shipment, drastically reducing costs. 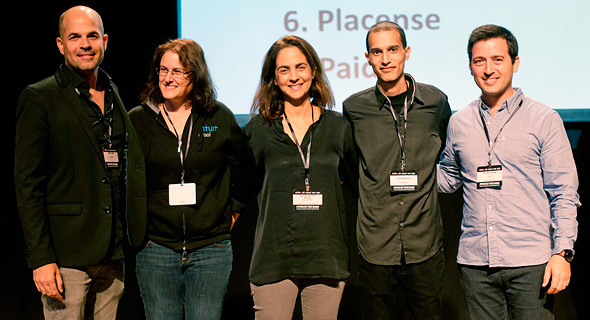 Tel Aviv-based EasySend Ltd. won third place. Founded in 2016, the company helps businesses turn document-based transactions into digital transactions, by automatically converting paper forms into digital processes. Judges at the event included Citi’s Shinar; Deutsche Telekom’s Kahan; Lior Simon, head of Israel at Arbor Ventures; Yoav Tzroya, general partner at Jerusalem Venture Partners; Nimrod Cohen, managing partner at TAU Ventures; Dafna Winocur, of Innovation Endeavors; Idit Muallem, principle at Pitango Venture Partners; Moshe Friedman, co-founder of nonprofit KamaTech; Meirav Har Noy, founder and managing partner at Moneta Seeds; Yanai Oron, general partner at Vertex Ventures; Gilad Engel, partner at Target Global; Baat Enosh, director of strategy and innovation at Intuit; Kobi Samboursky, co-founder and managing partner at Glilot Capital Partners; Roi Ben Daniel, ventures lead at Visa; Hanoch Papoushado, chief investment officer at Discount Capital; Yuval Shachar, executive chairman at startup foundry Team8; Tsafrir Attar, head of Citi Accelerator; Shahar Friedman, head of Visa Innovation Studio Tel Aviv; Karina Rubinstein, director of business development at the Israel Innovation Authority; Yael Visbord Suchary, innovation and fintech director at Discount Bank; Ehud Levy, general partner at Canaan Partners Israel; Sivan Shamri Dahan, partner at Qumra Capital; Merav Weinryb, managing director at Qualcomm Ventures; and Yuval Cohen, founder and managing partner at StageOne Ventures.